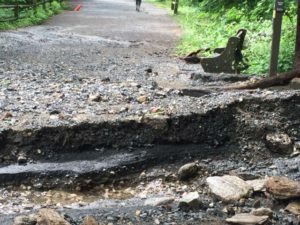 There is a growing and urgent need for additional resources to address weather-related infrastructure damage in Wissahickon Valley Park as climate change is occurring NOW. Now more than ever, we need your support. 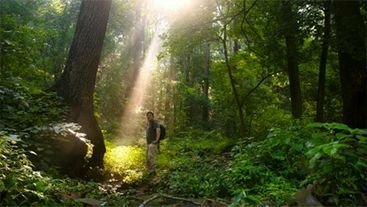 This Giving Tuesday, please donate to help FOW continue our work to preserve the Wissahickon Valley Park for future generations. Weather conditions this year suggest we are entering a new climate cycle characterized by more frequent and higher volume rain events. While large weather events have always caused infrastructure damage in the park, these damaging weather ‘patterns’ are more frequent, with more intense storms occurring throughout the year. Damage to park infrastructure far outpaces FOW’s current resources and manpower to respond effectively in a timely manner. Several volunteer work days and events were canceled and major projects postponed this year due to weather – either rain or extreme heat and humidity. The weather-related damage to the park this year alone clearly demonstrates that we must become better equipped to respond to this challenge by increasing infrastructure resiliency as we conduct repairs and maintenance. FOW is focusing on improving coordination with our municipal partners and leveraging material, equipment, and labor resources as available. Closer coordination allows us to better inform our partners of changing conditions in the park, raising their sense of urgency to respond and positioning FOW as a reliable and essential partner for multiple city agencies. Additionally, our volunteer crew leaders will move away from coordinating large trail projects to focusing on leading smaller volunteer groups on routine trail maintenance as the main method for preventing further infrastructure degradation, thereby increasing resiliency. In the course of conducting maintenance activities, repair projects will be identified, assessed and scheduled for small Crew Leader-led volunteer work days, essentially functioning as target strike teams. Successfully implementing these two concurrent strategies will maximize FOW’s current resources. However, a significant proportion of storm damage repairs require resources beyond our current capacity and are in urgent need of attention. As we’ve seen this year, these situations left unattended will continue to worsen with each passing storm. 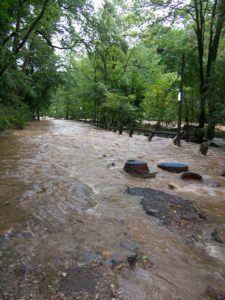 With your support, FOW can continue to respond quickly and effectively to threats—both short-and long-term—to Wissahickon Valley Park. Together we can preserve Wissahickon Valley Park as a site for leisure, recreation, history, and the appreciation of nature for generations to come. 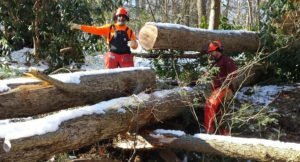 – Already this year, our volunteer sawyers have removed over 100 fallen trees from the upper trails. Many of these trees have destroyed or damaged trail segments, foot bridges, fences, and destabilized hillsides, creating additional hazards. 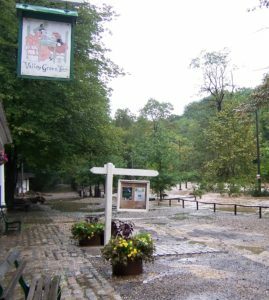 – Heavy rain storms have created severe damage to natural surface trails as well as gravel access roads (‘troads’). A minor landslide occurred beside the white trail as it meets Livezey lane – creating a 5′ wide chasm along 100′ of trail edge. We’ve temporarily secured the site and re-routed the trail for now. 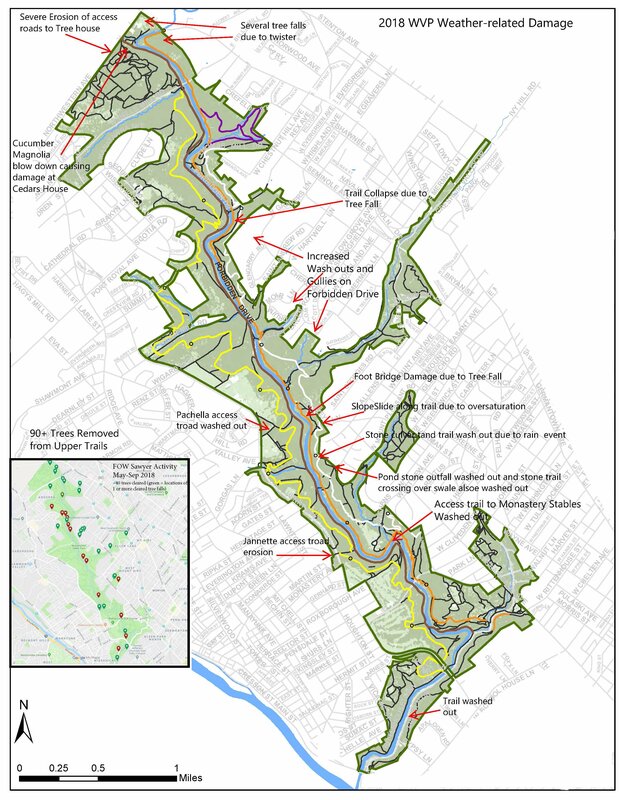 – Related to that, a deep gully has developed from storm water flows originating from Livezey lane and has washed out a section of the orange trail. This has been developing for a few years but has really opened up this year. 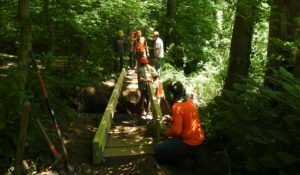 We installed a new wooden footbridge on the Orange Trail, but work is still needed to divert the storm water and repair the gully. 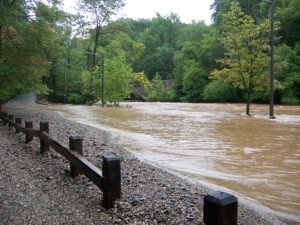 – The ‘troad’ from Pachella field to Forbidden Drive was completely washed out with most of the material ending up on Forbidden Drive and/or getting washed down the stream banks into the creek. PWD stepped in and did a temporary repair but this site needs a trail re-route and another green stormwater infrastructure intervention. – Several other access ‘troads’ in the park have begun to gully severely and will continue to deteriorate with the next heavy rain event. 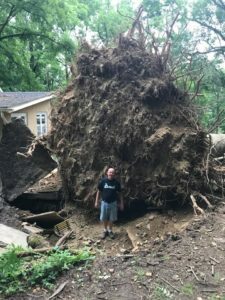 – And let’s not forget the ‘twister’ that ripped through the Andorra area, knocking over dozens of trees and resulting in the loss of our state-champion Cucumber Magnolia. Cedars House dodged a catastrophe, but still sustained damage.